This article shows you the easiest way to rip and copy Blu-ray movies to iPad Mini 4 for watching on the go. The 7.9-inch iPad Mini 4 comes with 2,048×1,536-pixel display as the iPad Mini 3. We can say without reservation that iPad Mini 4 absolutely rocks for watching movies on the go. Of course, most of us are not willing to pay iTunes’ ridiculous prices to watch movies an TV shows if you have own on Blu-ray. Instead, we’ll just need to rip those Blu-ray videos to iPad Mini 4 friendly video format. If you are insterested in doing likewise while having no idea about this, check out this solution here. To get Blu-ray movies playable on iPad Mini 4, you’ll need a third-party Blu-ray ripping software. Most of you are likely familiar with the excellent Handbrake for ripping standard Def DVDs, but while the latest version of the software has added SOME support for reading Blu-Ray folder structures, it cannot yet decrypt the Blu-Ray discs the way it can with regular DVDs, So you’ll need to find an alternative to Handbrake. Brorsoft Blu-ray Ripper for Mac (Read the review) is bee’s knees, which can help you fast rip Blu-ray yet DVD discs to a format playable by iPad Mini 4 while keeping the original quality. With it, ripping Blu-ray for iPad Mini 4 is simple as ABC. After downloding, follow the wizard to install and run the program. Then follow the steps below to convert Blu-ray to iPad Mini 4 comaptible formats in a few clicks! PS: The program is available for both Mac and Windows users, if you’re using a Windows PC, turn to the Windows version here. The process to rip Blu-ray to iPad Mini 4 on Mac/Windows is almost the same. Make sure you get the right program according to your computer system. If you only want to copy DVD movies to iPad Mini 4 for amusement on the go, please turn to Brorsoft DVD Ripper. Step 1: Run the Mac Blu-ray to iPad Mini 4 converter on your computer, and insert the Blu-ray disc that contains the Blu-ray movies you want into your BD drive. Click the disc button to choose the Blu-ray files you want to convert. Note that you can also import Blu-ray Folders, ISO/IFO files. You can also select your desired subtitle and audio track. Step 2: Click the output format dropdown list; you’ll get a lot of choices. 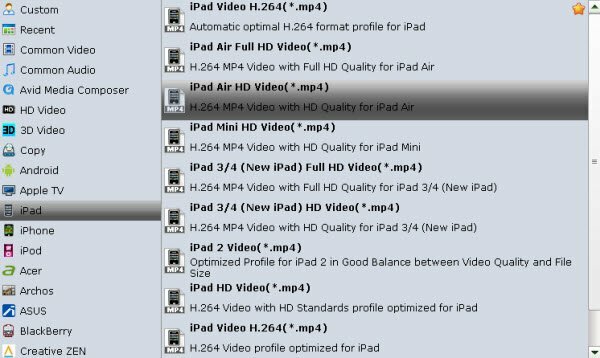 For converting DVD to iPad Mini 4/Mini 3, you can select “iPad > iPad Mini HD Video (*.mp4)” as output format. Or, you can choose MP4, M4V, MOV from “Common Video” as the target format. Tip: You can click “Settings” to change the video encoder, resolution, frame rate, etc. as you wish. You’d better keep a balance between video size and video quality. Step 3: When everything is OK, press the big “Convert” button to start ripping 1080p Blu-ray to iPad Mini 4/3. Once completed, locate and find the generated .mp4 files by clicking “Open” icon on application UI. 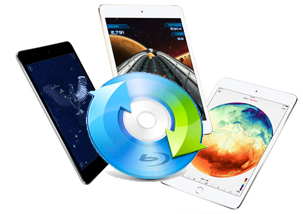 Now you can transfer the ripped Blu-ray videos to iTunes library and sync them to your iPad Mini. You’re done! Now you are able to enjoy converted Blu-ray movie on iPad Mini 4, iPad Mini 3 even iPad Air, iPad Pro without hassle.